If you’re under 18, you’re under attack from the very people who are supposed to keep you from harm. Adults in the small town of Creek’s Cause have been infected with a parasite and turned into inhuman creatures that drag children to unimaginable horrors for mysterious purposes. 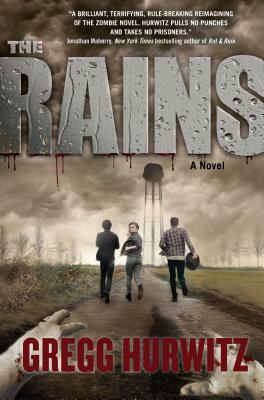 Chance Rain and his older brother Patrick- soon to be 18- join a small group of children who attempt to save themselves before the teenagers in their ranks become infected. Hurwitz displays his considerable talent for suspense in this horrific yet surprisingly sensitive story. The non-stop action will keep you turning pages until the very end! If you’re under 18, you’re under attack from the very people who are supposed to keep you from harm. Adults in the small town of Creek’s Cause have been infected with a parasite and turned into inhuman creatures that drag children to unimaginable horrors for mysterious purposes. Chance Rain and his older brother Patrick - soon to be 18 - join a small group of children who attempt to save themselves before the teenagers in their ranks become infected. Hurwitz displays his considerable talent for suspense in this horrific yet surprisingly sensitive story. The non-stop action in The Rains will keep you turning pages until the very end!